The T1 the first dive computer which is not operated with buttons but with a wheel. Operation was never so intuitive and fast before. Other outstanding features are the crisp OLED display and various wired and wireless interfaces. The housing is fabricated from Delrin. The sapphire window is ultra scratch resistant. Core component of the T1 is a ultra low power 32-bit microcontroller. A precise 24-bit ambient pressure sensor is used to measure depth and altitude. Data are store on 2Gb internal memory. The T1 uses the Buehlmann ZH-L16 algorithm together with Gradient Factors. The algorithm is based on 16 compartments for Nitrogen and 16 compartments for Helium. With up to 8 pre-programmable gases it is possible to use the T1 for the most sophisticated technical dives. A 16 compartment bar graph visualizes inert gas loadings during the dive. The crisp 1.7” color OLED screen is easily readable under all conditions. Especially in deep, night and cave diving the bright and high contrast screen is much easier to read than conventional LCD screens. Select which data to display: You can switch the T1 between several screens. A 3-axis tilt compensated digital compass for precise navigation. Up to 3 headings can be stored. Rotate the wheel to change settings, navigate in the menu and switch between screens. Operation of a dive computer was never so easy and intuitive before. 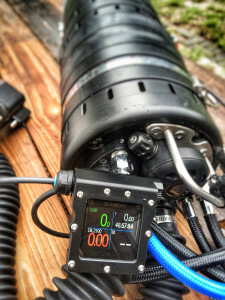 Use the T1 to read out pO2 sensors in a closed circuit rebreather. Connect the T1 to a USB port to charge the inbuilt Li-Ion battery and to download dive data from the 2GB internal memory or to update the Firmware. Firmware updates can be downloaded from the SEABEAR website free of charge. 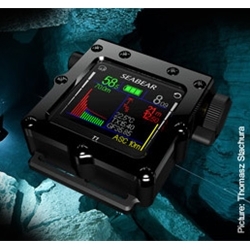 The SEABEAR T1 is like the H³ the first dive computer equipped with a Near Field Communication Interface (NFC) for seamless integration into mobile environments. Dive data can easily be downloaded to NFC enabld smart phones without the need for pairing the devices. An app is available for Android phones to download and visualize dives. Share your dive profiles and data with a single touch on social networks like Facebook or Twitter.